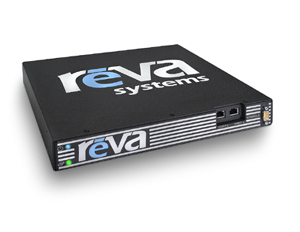 The Reva TAP 331 is an RFID Network Infrastructure appliance for sites with modest numbers of RFID readers that delivers accurate, actionable data, and scalable implementations. The TAP 331 is well suited to deployments at retail stores, branch offices, satellite processing centers, temporary operations, small manufacturing plants, RFID start up or pilot sites and other facilities where only a small number of read points are currently required. The Reva TAP 331 is an RFID Network Infrastructure appliance for sites with modest numbers of RFID readers that delivers accurate, actionable data and scalable implementations. The Reva Tag Acquisition Processor (TAP) family of products enable scalable deployment of RFID for production operations in any environment and deliver the accurate, actionable data that enterprises need to create ROI from RFID implementations. The TAP 331 is built to deliver the benefits of RFID Network Infrastructure at facilities that require only modest numbers of RFID readers. The TAP 331 is well suited to deployments at retail stores, branch offices, satellite processing centers, temporary operations, small manufacturing plants, RFID start up or pilot sites and other facilities where only a small number of read points are currently required. The Reva TAP 331 is the right RFID Network Infrastructure choice for multi-site production deployments where modest numbers of readers are required. TAP 331s provide a seemless upgrade path as device needs expand at individual facilities. Scalability is achieved by either adding additional TAP 331s to share the reader and processing load or upgrading the installation to a TAP 701 model that uses the same configuration file and management console. Coordinates and controls both fixed and mobile RFID readers via TCP/IP over wired or wireless LANs in order to minimize interference and optimize RF utilization. Intelligently processes high volumes of acquired tag data at a site-wide level, correlating tag reads and utilizing user-defined locations to provide consolidated and meaningful tag observation data. Provides RFID data services to client applications that leverage the acquired tag data, isolating them from interactions and physical changes at the tag identification layer, and providing them with high quality, application-ready data. Provides scalability and load sharing with redundancy against unexpected single system failure situations through automatic distribution of services in multi-TAP deployments. The Reva Management Console enables users to remotely configure, deploy, and monitor site operations at each facility. Includes visual device placement, device health and centralized reader firmware upgrades.